Now we all love Embossing Enamels don't we...I know for me the first time seeing that magical moment the powder turns to a lovely molten enamel I was hooked. But the one thing with them is how different they can look once melted, I mean we all know Gold is Gold, but now there is so many beautiful colours and mixes and with the fantastic enamels from Globecraft & Piccolo there tends to be glitters & a couple of different colours...which you cannot really see until they are melted. The circles are the right size for the applicator of your Enamel and Embossing powder. Here is the blank chart, please feel free to save it and use. 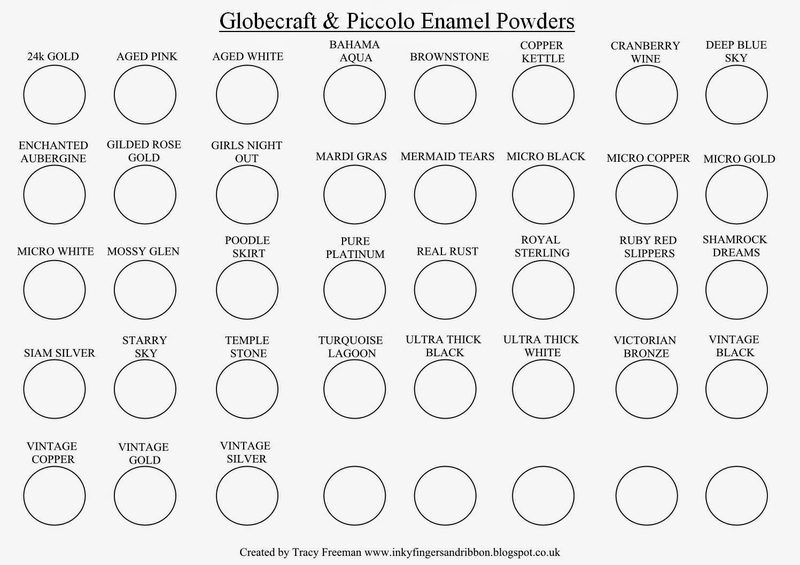 Wonderful idea for keeping track of the enamels, really makes it easy when looking for a color to use.